Flat Screen Monitor Arm. Modular Ergonomic Design. This model includes a top mount c-clamp attachment which attaches above the desk surface for a more ergonomic and easier installation. With a slim profile mxv offers 13 (33 cm) of integrated height adjustment integrated tilt and more-all on a convenient swivel base. This slim articulating monitor arm lets you mount a flat-panel display on your desk or table with dynamic adjustments that make it easy to position your monitor for the perfect viewing angle and optimal comfort. This TAA compliant product adheres to the requirements of the US Federal Trade Agreements Act (TAA) allowing government GSA Schedule purchases. The versatile monitor arm lets you extend tilt pan swivel and pivot your display with a full range of motion across multiple axes and features spring-assisted height adjustments for effortless positioning. For viewing longer pages or blocks of code without having to scroll down your screen the LCD arm also supports simple landscape-to-portrait display rotation. With a stylish slim design that looks great and takes up only a small amount of desk space the monitor arm gives you the flexibility to locate your display as needed while reclaiming valuable workspace on your desk. Mounting your display above the desk surface enables you to adjust your display height position and viewing angles easily for an ergonomic work environment. Supporting 12 - 26 displays up to a maximum weight capacity of 15lbs (7kg) the monitor-mounting arm holds your display with ease and integrates a cable management channel to keep things neat. For added installation flexibility the included mounting hardware can either clamp to the side of your desk / table or mount through a grommet hole. .Device Supported: Flat Panel Display. Maximum Load Capacity: 35.60 lb. Maximum Screen Size Supported: 29.Features: Articulating. Features: Ergonomic. Features: Adjustable Height. Features: Cable Management. Features: Flexible. Features: Adjustable Viewing Angle. Features: Tilt. Features: 180° Swivel. Features: 360° Rotation. Features: Pivot. Color: Black. Color: Chrome. VESA Mount Compatible: Yes. VESA Mount Standard: 75 x 75.VESA Mount Standard: 100 x 100.Material: Aluminum. Weight (Approximate): 19.80 lb. Compatibility: 2 x Monitors. Green Compliant: Yes. Green Compliance Certificate/Authority: RoHS. Limited Warranty: 5 Year." .Device Supported: Flat Panel Display. Maximum Load Capacity: 17.80 lb. Maximum Screen Size Supported: 29.Features: Articulating. Features: Ergonomic. Features: Flexible. Features: Adjustable Viewing Angle. Features: Adjustable Height. Features: Tilt. Features: 180° Swivel. Features: 360° Rotation. Features: Cable Management. Features: Pivot. Color: Black. Color: Chrome. VESA Mount Compatible: Yes. VESA Mount Standard: 75 x 75.VESA Mount Standard: 100 x 100.Material: Aluminum. Weight (Approximate): 11 lb. Compatibility: Monitor. Green Compliant: Yes. Green Compliance Certificate/Authority: RoHS. Limited Warranty: 5 Year." 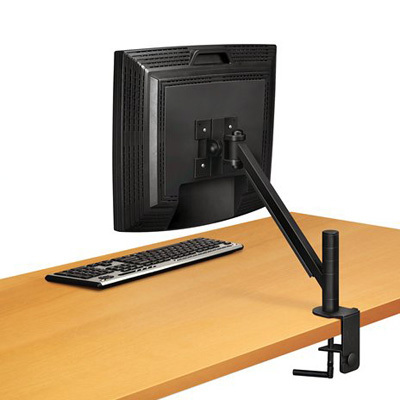 Heavy-duty monitor arm accommodates the largest and heaviest monitors up to 25 lbs and 32? Elevates flat panel monitors to comfortable viewing height to prevent neck strain. Includes five 1 height adjustments. Supports 21 monitor screens up to 20 lbs. Tilts up or down +/- 45 pivots left to right 180 and allows 360 screen rotation. Clamps to surfaces up to 2 1/2 thick (2 desk overhang required) or mounts in grommet hole. Includes cord management system. Entire arm extends out 21 from pole for additional reach. Weight capacity of 17 lbs. All models feature a pole mount design. Standard pole height is 15-3/4 H. Optional 27-1/2 H post available upon request. Standard pole height allows arm to travel from 3 to 13. Your choice of either the desk clamp or grommet mount. Desk clamp mounts to work surfaces from 1/2 to 3-15/16 thickness. Grommet mounts to work surfaces from 1/2 to 1-1/2 thickness. Monitors will swivel tilt and rotate up to 360°. Assembly required; Mounting hardware included. Single arm connection to pole. Holds single monitor. Arm extends out 16 from pole. Weight capacity of 22 lbs. Order standard with clamp mount (FPA825VC) or optional grommet mount (FPA825VG)). Both dual arms extend out 21 from pole for additional reach. Weight capacity of 17 lbs. for each arm. All models feature a pole mount design. Standard pole height is 15 3/4 H. Optional 27-1/2 H post available upon request.